The world has certainly gotten much smaller and more challenging overnight! Having arrived at my rehabilitation hospital, I was too new at this “game” to have any expectations. In retrospect I suppose a common assumption would be that such a facility would be designed, laid out and geared towards making the facility as “handicapped friendly” as possible. For the most part this was the case, but as with everything, there is always room for improvement. One of the greatest obstacles encountered by any institution is time. From the moment a ‘state of the art’ facility is constructed, it is already becoming outdated as the months pass. New innovations that are created and cannot always be retrofitted into the existing building. Funding is a perpetual problem for any organization. Taking those factors into consideration, obstacles, challenges and irritations were encountered. Some might be easily remedied while others would require a major alteration. On admission I was bed-bound and immobile. The room I shared with one other patient was immaculately clean and laid out in a manner to provide adequate privacy. My personal items had arrived with me and the first chore was to find a convenient and accessible location to store them. Without lower body mobility, my range of accessibility (reach) extended on each side of the bed from about my knees to my head. The head of the mechanical bed raised and lowered adding a few more precious inches to my immediate world. My clothes were placed in a closet built diagonally into the room. This seemed to be logical as it would at some time be easily approached but the folding doors projected outward somewhat blocking the opening. Not a big problem as I would not have to use it for some time to come. I took stock of what I had at hand. To my right I had a desk which extended from the rear wall about 2 feet. It provided a flat surface with about 2 square feet of reachable surface. I had to lower the bed and reach way back to obtain anything placed here. The desk also contained a cabinet with three drawers. With effort, I could manage to reach backwards and pull open the upper and middle drawers. There I placed my ‘walkman’ and Cds , a notebook with pencils, etc. Hospital beds have no headboard so there was no storage there. That was about the extent of what was immediately available. There was a mobile hospital ‘bed table’ used to place meal tray upon. Clearly this could not used for anything permanent except for meals. A nurse did find another older rickety model which I placed lengthwise on the opposite side of my bed. The wheels were quite seized so it would have to stay where placed. I was warned me that if admissions increased I may lose the table to another patient. The room was laid out to initially accommodate four patients but had now been designated as semi-private. Because of that, the opposite wall was a mirror image of my setting but without the bed. 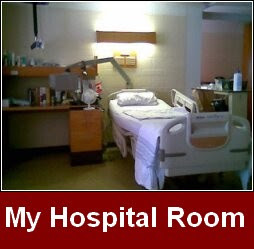 As the desk itself was attached to the wall, I had my wife scavenge the lockable desk cabinet and wheel it to the left side head of my bed next to the hospital table. This gave me a total of about 6 square feet of precious flat surfaces for my 3 month stay. My wife had purchased some small plastic baskets at a local “Dollar Store” which served to organize my items and prevent them off of the flat surfaces. These were distributed over the tables and with some effort all could be reached. Everyone has personal hygiene items such as combs, toothbrushes & paste, razors and the like. A jug of water, cans of pop or juice, a few snacks etc. all had to find a home as did my lap-top computer and books. Attached to the wall above my bed was a 3 foot long fluorescent light fixture which had four settings activated by a single pull-string . Lower reading illumination, upper ambient illumination, both on providing bright room illumination and ‘off’. This was nice but the pull chain had long been broken and a piece of string had been tied to it. It would dangle and get lost so I had to scrounge around to find another string which I would then tie to my TV monitor arm so it would be reachable. That was my immediate world. What could be done to improve my world? First of all, we all have possessions which are dear to us. Some are personal items such as pictures or books, music etc. which provide support and aid in our recovery. Others are necessities such as a phone, toiletries, medications and the like. Each must have a secure and accessible location. Tables or cabinets on hinges or wings that could be swung out to allow access by nursing staff then to be swung back in when finished would have provided much more storage. This would be an innovative design that would improve any such longer term facility. Flat surfaces had no raised edges. I had a perpetual fear of having some item roll off a table and drop on the floor where I would have to page a nurse or wait for one to appear to retrieve it. Such a small change would make a big difference. The TV support bracket was placed right behind the bed. When extended to its fullest position, the TV was dangling right in front of one’s face making it difficult to see. A minor irritant but an irritant nevertheless. 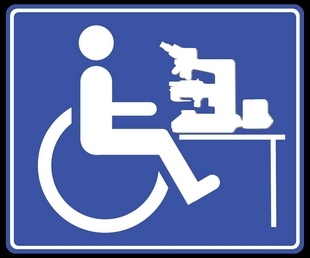 On acquiring my wheelchair, I had the opportunity to begin exploring the facility and grounds. In general the facility was laid out logically. Improvements were ongoing so there was the inconvenience of construction with the anticipation of greater accessibility. In the cafeteria the some vending machines were placed in the corner of the room where they could be approached from only one side. Wheelchair leg supports would often hit the wall making the reaching for the beverage difficult. The vending machines dispense port was too low for many to reach. If the machines were placed in a central location and slightly raised accessibility would be improved. Elevators were handicap friendly with both rear and front doors. This allowed wheelchairs to exit without having to turn around. An overhead mirror gave a better view if backing out of the lift. Buttons were in Braille and a tone announced the floor. Doors could have been improved. Granted, the front was shut due to ongoing construction. A side door was activated by a sensor and allowed easy access until it too was shut down for construction. A back door leading to an outdoor park-like area was also on an overhead sensor but the door was so narrow that I could barely scrape through. Access to the chapel was easy but when trying to exit I found that the activation button was placed so close to the door that when pressed, the door would swing out and hit my chair before I could back out of the way. Sensing an obstacle, it would shut again. This comical routine repeated itself a few times until I managed my escape. Held hostage by God! Bathrooms had sinks which accommodated wheelchairs but the taps were still set so far back that they were difficult to reach. I arranged some personal items to make them convenient only to find them pushed far to the back after the cleaning staff came through. Just a laugh and not a problem. Other conference and meeting rooms had no door openers, were far to narrow to comfortably accommodate all the wheelchair sizes present or had sharp 90 degree turns immediately on entering. Navigation was often a challenge. Light switches were sometimes difficult to reach. The problem was not so much the height but rather that they were sometimes blocked by furniture and therefore inaccessible. Garbage receptacles should have been higher. Trying to fling a piece of chewed gum into a small bin on the floor would inevitably end up stuck to the wall, the floor or the outside of the container itself. A small change would make things easier and possibly more hygienic. Newspapers could be purchased but the vending boxes were located outside a door that was soon closed down because of the renovations. Two papers were represented but only one box was stocked. The mailbox was located here as well. To the credit of the hospital, they were moved to the front of the building when the main entrance reopened. Presumably variety of papers, sundries and treats will be easily available when the newly constructed ‘variety shop’ opens. The gymnasium and physiotherapy rooms were easily accessible and well laid out. The grounds themselves were beautiful with a ravine like setting and paved trails where one could escape the institutional like atmosphere if only for a moment. A beautiful garden had just been constructed where you could catch some sun, lose yourself in a book or just enjoy the scenery. The hospital provided two common area internet computers which the patients could use. The maximum capacity of the hospital is about 60 full time patients. The popularity of the computers was evident by their continuous use. I was dismayed to see patients using the computers for hours on end playing games such as 'solitaire' thereby preventing others from using them for correspondence and research. Other means of providing this type of entertainment should be considered. Although signs stated that the computers were for "patient use only", visiting parents would often park their kids there to entertain them while visiting. It is my understanding that the hospital was reluctant to expand the number of computers or to introduce hospital wide wireless wi-fi internet service as part of the recuperative process is to mingle and interrelate with other patients facing similar challenges. Rumors were that wi-fi would be introduced as they realize that many patients are from distant towns and correspondence with family and friends is important in the recovery process. 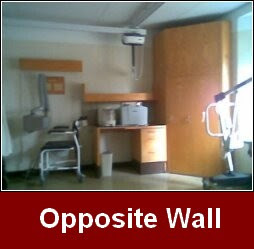 The argument could be made that the hospital should not be made overly accommodating as the real world would present these, as well as more challenging situations. This would be a learning experience. On the other hand, perhaps life at the rehab should be made as easy and friendly as possible during these early traumatic and stressful days. All in all the facility was excellent but if the considerations stated could be implemented, it would make it that much better. With the ongoing renovations I expect that many of the issues raised will be addressed. My observations are not intended as a complaint but simply suggestions which might make this traumatic change in life just that more comforting. I have purposely not chosen to identify the facility by name but anyone with some insight can determine which institution I am referring to. The hospital provides service to a wide range of spinal injury patients. Some are ambulatory, some paraplegics and yet others quadriplegics. My assessment is from the perspective of a paraplegic. To others the facility may present itself more or less challenging.